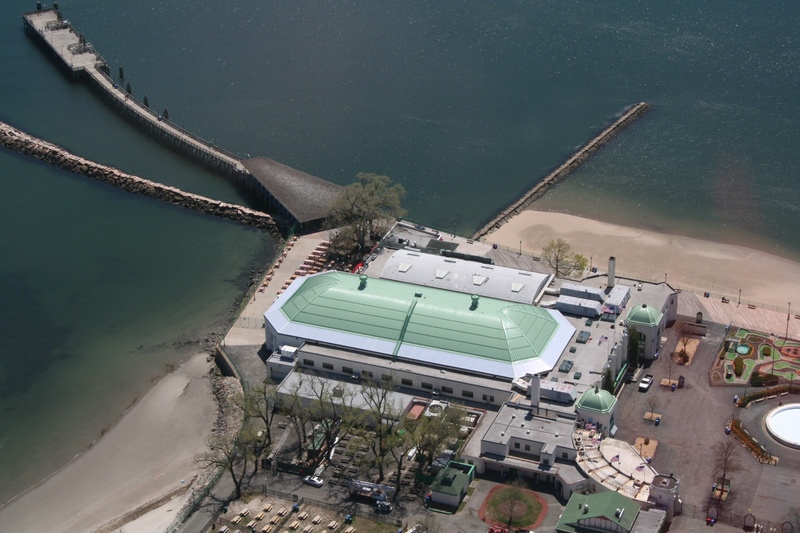 Declared a National Historic Landmark in 1987, the Playland “Ice Casino” was built in 1929, originally containing a main ice rink as well as a full dance floor on the second level that functioned as a dance hall through the 1940s and ’50s. It also had a full-service fine-dining restaurant and an outdoor café. Until 2002, the New York Rangers hockey team practiced at the Playland Ice Casino. Playland appears in scenes from many major motion pictures such as The Muppets Take Manhattan, Fatal Attraction, and most notably the amusement park was featured at the end of the 1988 movie Big starring Tom Hanks. The scenes with the Zoltar the Magnificent fortune teller machine were filmed on Playland’s boardwalk. In 2012, Hurricane Sandy wreaked havoc on the shores of New York and New Jersey, claiming parts of Playland’s boardwalk, causing flooding and substantial damage to the Ice Casino. 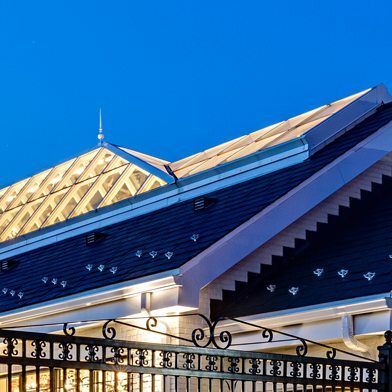 As part of the reconstruction efforts, the Casino’s old wooden shingle roof was to be replaced with a new standing seam metal roof, along with finding a better solution for the rubberized fabric perimeter which was not energy efficient and provided very little natural daylight. Because of the limited restoration budget, replacement costs and installation time were crucial. Sales representative Fontana Metal Sales Corp. presented the general contractor, MILCON Const. Corp, with an alternative to the fiberglass panel system originally specified – the Horizon C-Series. 30 to 40% savings in labor costs. The C-Series offered much quicker and simpler installation due to the fact that they were able to use the existing structure and supports to simply “skin” the structure, whereas the competitor would have to build an entire framing system for support. The C-Series standing seam construction also required no outside fasteners which saved time and labor. 10% savings in material costs. Using the existing structure and support system provided a 10% reduction in material costs. Greater daylight. The C-Series was shown to provide greater natural daylight than the originally specified fiberglass panels, which was critical since all the available daylight from the roof had to be transmitted through the diamond shaped window system which runs along the casino perimeter. Fontana Metal Sales Corp. was founded in 1960 as a manufacturer’s representative for construction products in the New York City and New Jersey metropolitan area. We are proud to represent the leading manufacturers in their respective product lines. The manufacturers that we represent provide the highest quality products and excellent service at competitive prices. Along with our support services such as design assistance, takeoffs, coordination, problem solving and others, we believe Fontana Metal Sales Corp. and its products are your best value. The Playland Ice Casino’s new metal roof with the Horizon C-Series translucent polycarbonate canopy system lighting the diamond windows along the perimeter. The old rubberized fabric perimeter was not energy efficient and provided very little natural daylight compared to the new Horizon C-Series system.